The Samsung Galaxy S4 is equipped with a 2600mAh battery, and while that might help you get through most of the day, if you're a power user it might not be enough juice to get you through the entire day. Luckily for those who own the device, it does come with a removable battery, which means that you can replace the current cell with a larger capacity battery. Mugen Power, a company that produces extended batteries for many top handsets, has announced such a battery for the Samsung Galaxy S4. The 5500mAh cell is a bit more than twice the size as the stock battery. The latter provides enough energy for 4 hours of video streaming which can be pushed to 8 with moderate use, and 17 hours of talk time. According to Mugen, its extended battery will more than just double those numbers. The company says that if the user limits the phone to browsing websites, replying to emails and installing the occasional app, the battery could last 3 to 4 days without a charge. 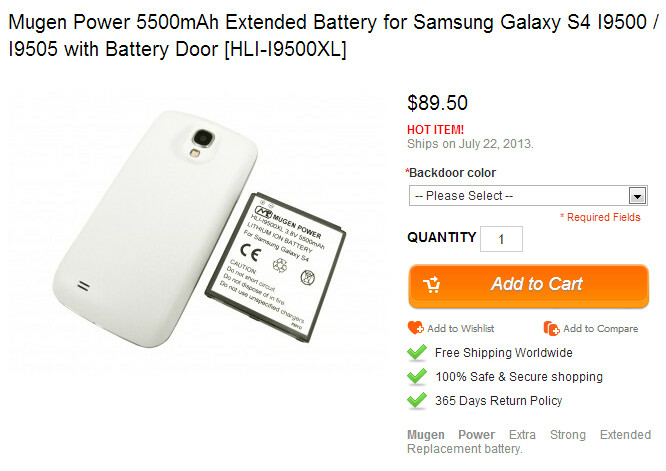 The Mugen extended battery for the Samsung Galaxy S4 will be priced at $89.50 and will ship starting on July 22nd. The back plates will come in white or black and will feature support for NFC. 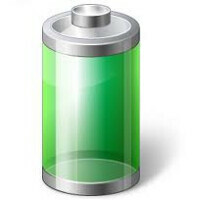 If you are interested in ordering the battery, click on the sourcelink. If you use your Samsung Galaxy S4 constantly, it might be the best investment you make in your phone. When everyone else is out of luck because of a dead battery, you will have the energy to keep on going. The Droid Razr Maxx series doesn't offer a removable battery and has no need for one. At well over a year old mine still manages 3-4 days between charges without requiring extra money or a huge gaudy hump on the back. Mindblowing battery at a mindblowing price, but I love it! Incomplete specifications....what about the thickness and weight? Big deal. I got myself a 7000mah extended battery for the S3 for $34 on Amazon. I don't care about weight or thickness, I just care about that it gives me about 4 days of battery life! I'm not switching phones soon. I saw one that was 7500mah but for galaxy note 2 and I believe same price. Maybe there's one for S4 too. It's called "zero lemon." Great until you drop it without a case because it's more slippery than an Alaskan salmon. Then all the battery in the world won't do you any good. Rather get a battery case if I'm going to spend that much moolah. Or (call me crazy here) you can spend 30 bucks on an OEM replacement battery and have a total of 5200 mAh and NOT have a huge caseless phone that screams for gravity to yank it from your hands. Your crazy. Just kidding. I've never dropped a phone in my life. And I've had plenty of phones. Plus the back cover slides over the edges of phone keeping it solid in place. My original battery sucked. Had it on for only 6 hrs before it died and didn't even touch it besides taking some pictures for maybe 30 minutes. The extended battery case isn't slippery at all. 7000 for $34 is way better than 5500 for $90. I have owned this battery for about a month now, and I have to say it is a great investment. I tried to see how much I could go without charging and I could have a good 3 days with moderate use. (That includes bluetooth always on with Galaxy Gear) I recommend this, but the only drawback is no case for it.